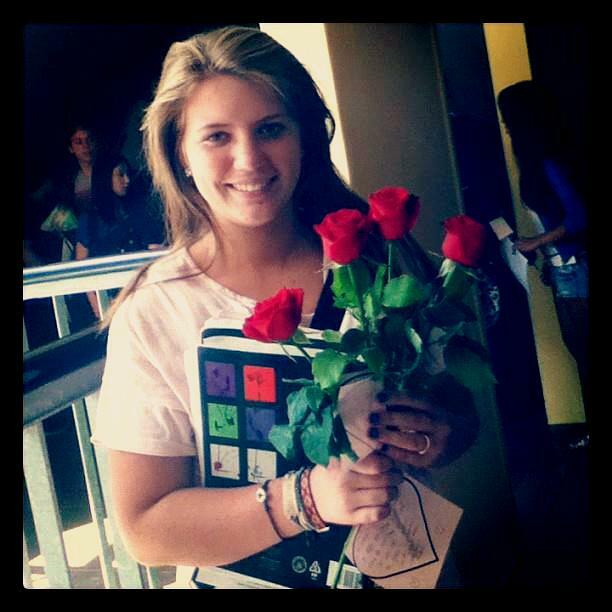 I think I can say I have always had a pretty good Valentines Day. With or without a Valentine. This year was okay, but wasnt a huge deal. I remember when I was younger and I would get so much candy, and I would wear pink and make valentines for my friends. This year, I was kind of missing my friends at home on Valentines Day. At my school you can by candy grams. You can either buy Roses or Candy or both, and then write a note, at the end of the last period they would be delivered to you. This year I got 6 roses, and 5 candys. I was very surprised, because I didnt think I would get anything. 4 of the roses were from good friends of mine, the other two were from secret admireres, some of the candy were from friends, and some from some people who I wouldnt expect to send me anything. Needless to say it was very sweet, and I enjoyed looking at my roses during class. Two of my close friends that I (accidently forgot to send something too) I gave them a rose from mine, because I learned to share jajaja. It was a nice day in Argentina.